Had my one year review at work last week. I met with my boss for an hour and we talked about what I was doing well and what I was doing poorly. I talk to him face to face a few times a week using video conferencing. I also have a mentor at Microsoft who helps me navigate the maze. He didn't have a web camera so I just had one sent to him so that it showed up on his desk one morning. I probably do two or three videos calls per day now. I had a meeting this morning with six manager-types in a conference room and I finally felt like I was contributing and could be heard. I hate doing conference calls these days. You can't be heard, you're constantly asking "who is speaking?" In the meeting today we used a Microsoft Roundtable for the meeting. In the last ten meetings I've asked all ten organizers to book a room with a Roundtable. Only two have. The belief is that it's hard to hook up, "I've never used it before," or just "I'll see what can we can do," then nothing. They are SO easy to use. Literally you plug it into your laptop and start a LiveMeeting. That's it. The drivers were already included with Live Meeting so there's literally no setup time. You can't believe (or maybe you can) how much better the experience is for me when we use this. The Roundtable stitches together 5 cameras at 15fps into a 1056x144 panorama that covers a full 360 degrees. It also has a 640x480 square "active speaker" video. The Roundtable knows where people are in the room physically based on sound and will automatically create a square video view (as if each person had their own personal camera) and will 'cut' between them keeping the active speaker in view. This totally removes the "who's speaking?" factor from meetings. I'm going to continue to ask anyone who wants to include me in a meeting to book a room with a Roundtable. We've got at least one on each floor, sometimes two, in most buildings. Microsoft's got internal chat through Office Communicator which I use to talk to all sorts of folks when email would be "too much." Communicator also acts as an global address book that lets me not only find out if someone is at their desk, but also when their next free block of time is as it's integrated into Exchange/Outlook. It also lets you "tag" someone if their presence changes - like if they've returned to their office. I also use Communicator to make quick calls to folks in the office. If people configure it correctly, it'll call their desk phones and they won't know I'm calling from my PC. 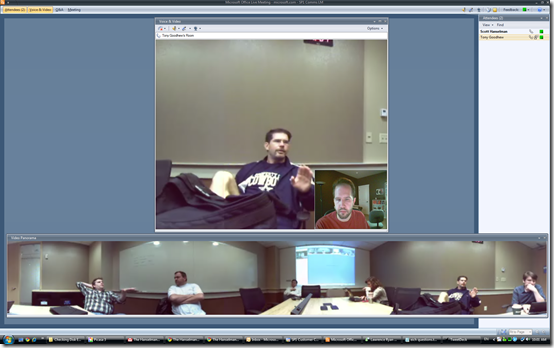 One of the things that Live Meeting doesn't do easily is quick meetings using video with a bunch of folks that are located all over. For this I tend to use ooVoo. 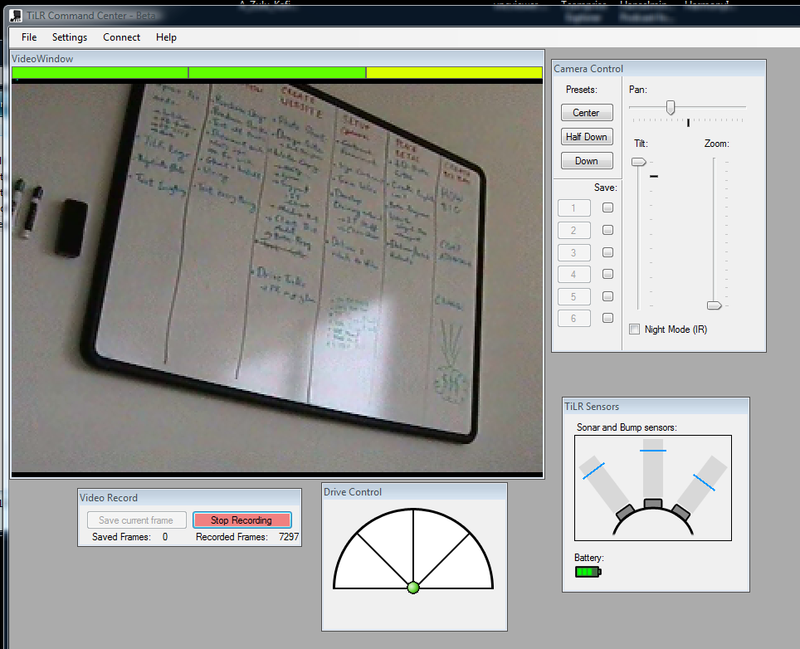 It's recently added 640x480 "High Quality" calls and unlike Skype, you don't need a Logitech special camera to do it. There's rumor (and a disabled menu item) that implies ooVoo will be going even higher-res, perhaps HD? OoVoo does great through firewalls and most importantly lets me pull in folks from all over, a lot like iChat for the Mac. In fact, ooVoo is also cross-platform. Often I've got to show my screen to someone I'm talking to. Live Meeting works for this, but it's a little heavy. I use both SharedView and CrossLoop, in that order. If SharedView fails to make it through the firewall (rarely happens) then I'll use CrossLoop. SharedView has the benefit that it supports sharing to up to 16 people and they just log in with their Live ID. CrossLoop is based on VNC and is a little slower to react, but I've never seen it not work. If you pay attention to the UI in CrossLoop and click "skip" at the right times, you can use it without creating an account. CrossLoop is great for fixing your parent's computer also. Future: Putting Feet on my Web Cam - Telepresence Robots? Chris Sells (who also works remotely) and I have been brainstorming and prototyping ideas for smarter telepresence. Chris really wants a high-res camera with an optical zoom so he can see whiteboards. Chris would be happy "without feet." He would like a computer/device/system that someone could pick up and take to a meeting - basically his disembodied virtual head - so he could participate in meetings. I'd really like be able to "walk" into someone's office. Just pop in to see if they are there. I want to get involved in hallway conversations. 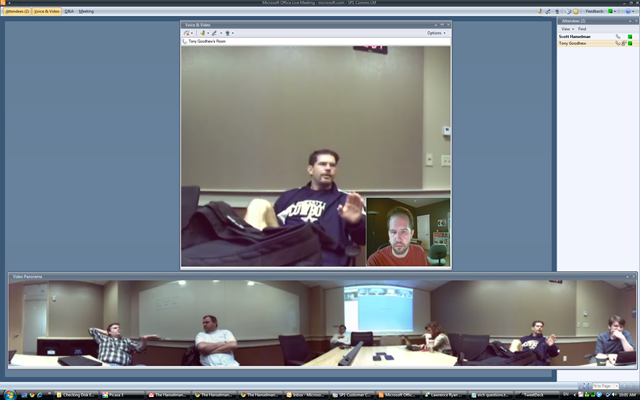 Chris and I had the opportunity to remotely drive/beta-test a Telepresence robot from RoboDynamics. They've built their software on .NET 3.0 and the robot runs XP. It was pretty sweet. They've got a 26x Optical Zoom and pan/tilt/zoom on the camera. There's a screen for your "head" so that folks can recognize you as you wander around. I was able to walk all over their office. The control console includes sonar and bumpers so when I got close to bumping into the fridge in their office kitchen I could "see" the distance to the fridge and avoid it. There's a lot to think about when it comes to letting a virtual beastie into your company. Is it on the network? Which network? What access? Who is it logged in as? What if it's stolen? As I understand it, RoboDynamics is looking to raise another round of funding so if you know someone, give them a call. Their stuff is REALLY impressive and cleanly implemented. There's video of the robot in action below. Microsoft's doing a lot around Robotics and Robotics Research. 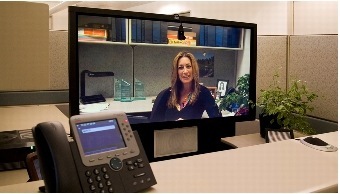 Hopefully there will be a real telepresence solution soon for remote workers. Maybe some Microsoftie will read this blog and let me beta test a robot or future telepresence platform...hint hint. Future: Big Screen Cubical Portal? Cisco has a telepresence platform that's pretty slick. Basically it's a really high res (1080p), really high framerate, low compression, 65-inch flat-screen or series of flat-screens. If I could have an office with one of these screens set up, then folks could just pop by my office to say Hi. I could have a "portal" between my house and work up on campus in Redmond. I thought I might be able to cobble something together with Skype or Office Communicator, maybe LiveMeeting, and some automation APIs. I could get a large monitor from Costco, maybe a no-name-brand 42" screen. However, the bosses nixed buying the screens. It's funny, it costs about $250 to fly me up there, plus maybe $200 for a few nights in a hotel. If I went up just four times, that would be enough to by two 42" LCDs. Then I could just get a few PCs and I'd be in business. Patience: Convincing people that setting these things up are the ONLY way I can effectively do my job. 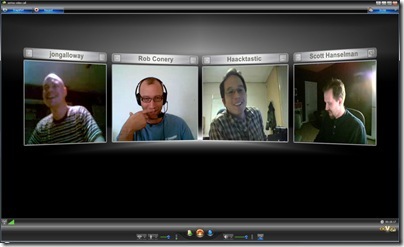 I am absolutely convinced that video conferencing builds relationships almost as much as showing up in person. If you've got the bandwidth to spare, talking to someone in F2F (face to face) via webcam conveys way more information than a phone call. 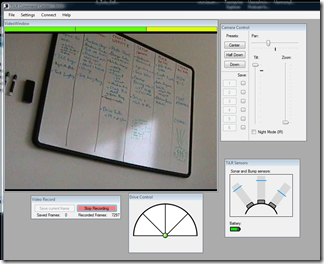 Also, using a 640x480 webcam and software is a breath of fresh air when compared to the video conferencing that you may have used in the past. Another few years and we'll have clear 720p or greater, commodity video conferencing. Do you work from home? What tools to you use to manage your remote life? What tools would you like to use? Interesting article, thanks for that. We are currently also discussing our options for getting a better way of communicating, and the roundtable is one of our hopes. They just recently offered the office communicator 2007 in our organization and we have to make sure all of our team (USA, Germany on 3 locations, Budapest) are upgraded. How is your experience with combining the RoundTable with normal telephone conference phones? Ways of communicating are evolving so fast. What will be possible in five years? One thing you didn't mention in the post was the Innovative Communications Alliance that Microsoft struck with Nortel back in July 2006. Have you tried any of the developments from this? I hope you appreciate how nice you have it. I asked to work from home on a regular basis instead of just occasionally, and I was told that I could never work from home again. I was also told that my 41.6 hours/week wasn't enough, and I would have to put in 43 hours because that was what was acceptable for my salary level. I'm hoping to work for a REAL company like this some day. Off topic, but it seems you are wasting a lot of your time trying to change a corporate cultural that doesn't want to change and will not change. You don't need a "boss". Consider finding a job where the company president considers you his colleague and doesn't question minor expenditures to improve your and the company's productivity. Sometimes you sound like your working from home situation is run like a big experiment. I started working from how recently and the only reason it works for me is that everyone in my team also works from home and knows the associated limitations. Anything different than that has always seemed a road paved with frustrations for me. I wish you have better luck than most people. (this Live Comment Preview is confusing) did I save the comment for later editing or did I post it? Anyhow, the real issue, IMO, is that remote work requires new means of evaluating the work. If the boss evaluates your efficiency by seeing a body sit at its designated place at designated hours, no amount of new technology will help. And often it is not just the boss. Often it is your coworkers who are in danger if their work gets evalueted by any other means than sitting in their designated chair and being social with boss' secretaries. Nice article! I just finished my 4th year of telecommuting halfway across the country and I can relate to the desire to be there in person. (I think we're both "people person" people.) I think some of my coworkers might be jealous of being able to have a "private office" (which of course, I have to manage - heating, Internet connections, backups, and all that jazz) and it's certainly easy to see the "greener grass" for me as it is for them. I think the biggest thing I've notice over the years is how much I come to connect and work well with people who are online and available over IM and telephone. It's sort of a virtual "open office door" policy that has made it easy to connect. Unfortunately, not all my coworkers are quite as tech savvy, so it takes extra effort to keep those relationships going, usually with phone calls and intentional time when I actually am there in person. To me, the biggest advantage of telepresence is eliminating the lack of context problems that come with e-mail and IM communications. You don't need an emoticon when you can display your emotions instead. Interesting article. Lets see how much of it requires corporate IT to setup and how much can be done by an ordinary individual trying to push technology into a company stuck in the 20th century. Scott - one of these camera mounts may provide you with a little more presence at MS than a mere robot. Is there any alternative to the RoundTable, thats not 3000$, I'm using a simple webcam now, I can string hundreds of them together for that amount of money? The ONLY way to feel more relevant, to be heard, and to feel like you're part of the team is to actually be there. Whether it's roundtable or robots, technology cannot replace real human interaction. We crave it, it's part of our genetic makeup; leave it alone. Roundtable looks cool, but I have to agree with another poster; is this financially feasible or even responsible if you're anyone but Microsoft, or Cisco, or some other primary tech leading company? For starters you can bet that those companies aren't paying retail price for it listed on , and being the manufacturer is MS paying for it at all. Great technology but the current tough times make it seem less likely a company is going to pony up for this given the current economic state of things. Tim - It depends. I certainly don't think you HAVE to work for Microsoft to have a RoundTable, certainly not if you're paying for airfare. The calculations for ROI are easy. If you fly to the home office once a month and you can drop it to every two or three months, then you can think about something like a RoundTable. However, a nice cheap wide-angle webcam makes a big difference also. Mark S - I agree and that's why I go up there once a month. However, webcams keep me involved on the days I'm not in town. SuperJason - Sounds like you work for a really mean company. Is this in the US? More and more companies are getting more progressive about working from home. Technology improvements pay a large part in this. Totally agree with you on the ROI aspect and I guess I may have been not just thinking in terms of meetings but also in terms of when you have to actually be on site to get into a secure data center or systems not available via remote access or to go to a client's site to give them that warm and fuzzy "Hey we really do luv you guys" feeling. In the end we all have to deal with a "client" its just a matter of if the client is a large part of the general population using windows or developing in .NET or if they're an organization using software specific to your company. I got to check out telepresence, and the best thing about it is that people are full sized, giving it a more life like feeling. You also give it your attention. Which is huge. You don't have people typing emails or surfing away during meetings. We tested a three screen model between Atlanta, GA, USA and Pal Alto, CA, USA and the experience was flawless. No lag, no blurring, just live interaction between the two groups. Thanks for the great post. I work at a client site that has these SmartBoards and thought maybe these could be used as a virtual share whiteboard between 2 locations. 2. Even worse, they sent me an email with my CLEARTEXT password in it. From that I take it that they also store the password in cleartext on their server. This is just soooo bad, and a testemony to not understanding anything about setting up a secure system and such a lack for customer security that I cannot accept it. Uninstall started already, plus I let them know to delete my account ASAP. I am not going to risk a major identity theft for a phone software, even if it is nice. PS: Plus, bloggers like you should really give software companies like ooVoo a hard time for such amateur security bugs! Scott, I am on a team of 20 and we hold one - two weekly conf calls. Most of us are at one of two locations but others are out and about. Maybe 6 locations in total. The Roundtable idea is interesting but it doesn't look like something that we can lug around as out meetings usually move between rooms. Does anyone make a resonalbe speaker phone (Polycom?) that can connect via USB for use with Live Meeting? Thinking just something I sit down at a meeting with along with my laptop.